After all the beach-related stuff it was time to leave Jervis Bay and head back on the road to Melbourne – this time by the direct route down the Hume Highway. But first we stopped off at Canberra to be wowed by the Australian Capital city. Now it may be me, or we missed the really good bits, or it was the wrong day of the week, or we didn’t spend enough time to do it justice . 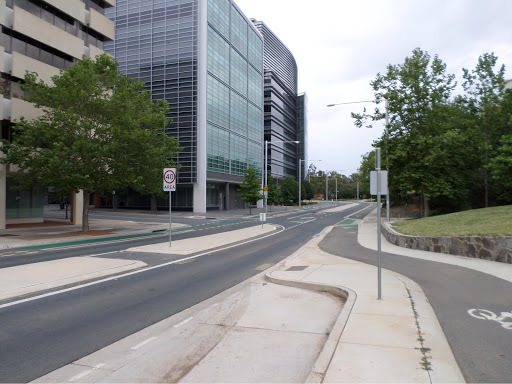 . . or is Canberra really just like a post-apocalyptic-flu-pandemic version of Milton Keynes . . .
Not one to be daunted I managed to squeeze a frisson of blog material out of it by booking us into the ‘University House’ accomodation on the Australian National University Campus. The offspring were instantly suspicious that I had only done this because I got some sort of academic deal; a charge which I strenuouly denied – though would have done if it had been an option on www.booking.com (other hotel reservation websites are available). The two-bedroom apartment was redolent of campus accomodation constructed in the 1950s, complete with teak-veneer furniture and faux-granite slab bathroom flooring with brass grouting strips that you get in all GB institutional buildings of a certain era. Hence the associated nostalgic whiff of many a conference past spent in student halls hung thick on the air . . .
. . . so that was Canberra. Back on the road the next day and I promised familia Evans a host of sights to amaze them on the 500 km trip down the Hume Highway which runs between Sydney and Melbourne . . .
1. 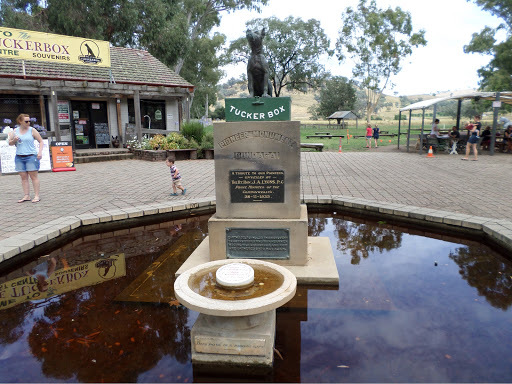 The Dog on the Tucker Box – who could fail to be awed by this tale of an ordinary drover who, after being afflicted by a broken wheel, exhaustedly turned to his nosh-box to find his dog sitting ‘or somethig else’ on top . . . a euphemistic reference on the family-friendly plaque methinks to the faithful hound taking a massive dump on the aforesaid box of tucker . . .
2. 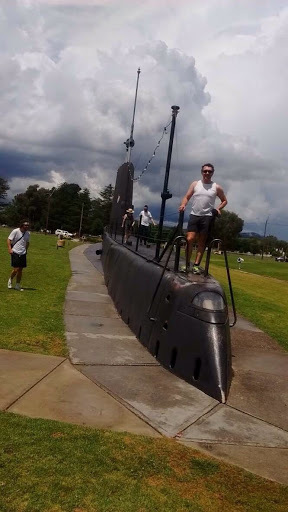 Holbrook Submarine Museum – hundreds of miles from the sea who would ave expected this, but to be a sub-mariner you have to be completely nuts . . .
3. Glenrowan, the site of Ned Kelly’s last stand – OK, so I ddn’t stop here because of the all-pervasive image in my head of that god-awful film with Mick Jagger wearing a bucket on his head . . .